In my third installment of my unlikely series of a teetotaler sampling extremely expensive drinks, I will discuss the Ballantine 30 Year Manhattan at the Hyatt Regency Tokyo bar Eau de Vie. 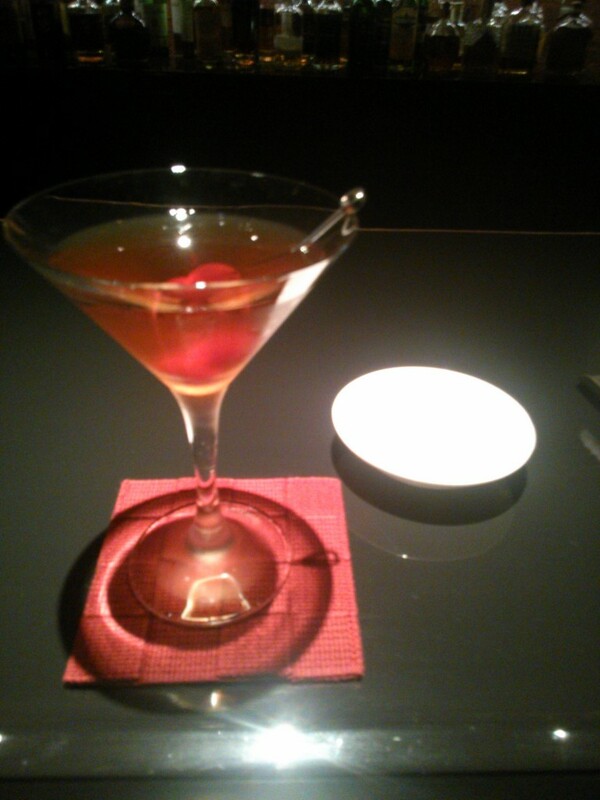 But mostly I will discuss my experience trying to drink the Ballantine 30 Year Manhattan at the Hyatt Regency Tokyo bar Eau de Vie. 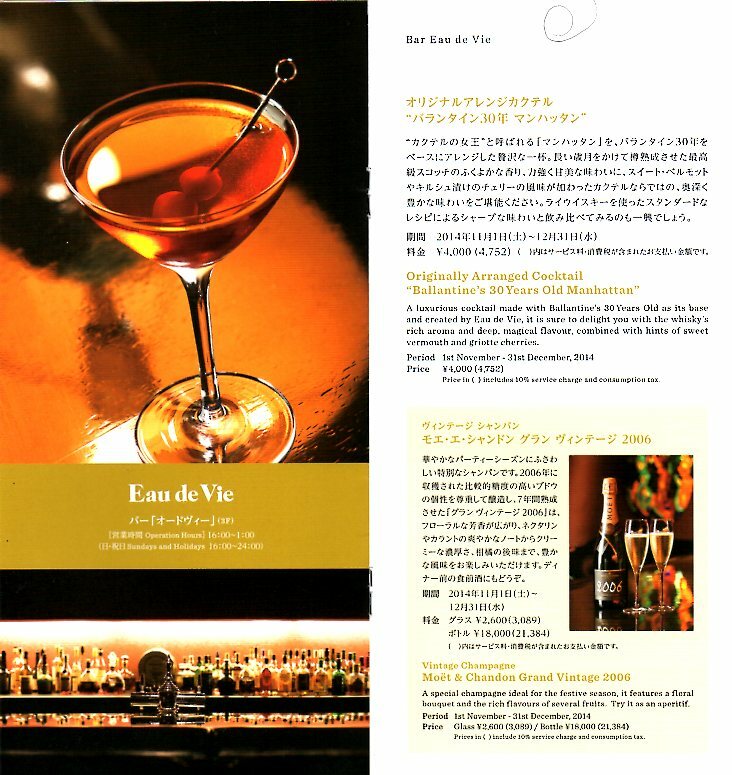 I was introduced to this drink via the monthly mailing from the special Hyatt Regency Tokyo Point Card club, completely separate from the regular Hyatt Gold Passport system. Not the greatest of scans. Time to get a new scanner. Of course, all of that implied luxury comes at a price: a whopping 4752 yen. Fortunately, the mailing also comes with some coupons for the hotel bars and restaurants, including a Happy Hour coupon for half price drinks before 8pm, so I decided that I could spend half of 4752 yen in the name of research. Now, the coupon passed out by the bar after I paid my tab last time around specifically states (in Japanese) that certain drinks may be exempt from the discount, but the coupon from the mailing had no such exemption. I was not about to spend the full 4752 yen on this drink, but I didn’t want to make a scene in the bar, so I canceled my drink order and went downstairs to the front desk to ask to talk with somebody about the Point Card program. For a couple of minutes we politely went back and forth between his stance of “We put 8000 yen worth of liquor into this drink and it’s already heavily discounted, we can’t discount it any more.” and my stance of “You pass out coupons that state that you can make such limitations, but this isn’t one of them!” Finally it got quiet, and I made my last plea, “Are you sure that there’s nothing that you can do?” At this, he sighed and said, “Would it be acceptable to make an exception for just one drink?” I thanked him and grudgingly accepted, though of course that was all that I ever wanted in the first place. So it was back to my seat, back to my original order, and back to my bar snacks. All of the staff at the Hyatt Regency Tokyo are the utmost professionals, so if there were any resentment on the part of the staff there was no way that I could have ever detected it. About five minutes later, my first ever Manhattan arrived, looking much as it did in the pamphlet. Like a kid learning to drive with a Bugatti Veyron. I couldn’t possibly say anything to do this drink justice, but that’s never stopped me before, so here goes. It was very strong with a hint of sweetness…but it felt like a strength you could control, not one that overpowers the drinker. It felt like I was snorting fire out my nose like a dragon, with it being a good feeling. The griotte cherries were about twice as strong and four times as sweet as the drink itself. I was able to nurse this drink for a good twenty minutes, feeling a very nice, dreamy buzz throughout the vast majority of that time. I also received another regular Happy Hour card. Maybe I’ll come back and try a regular Manhattan to see if I could tell the difference.